Chic large shopping tote with 3 horizontal earth tone stripes and gold-tone hardware. 2 pocket-style organizers, 1 zippered pocket, 1 pouch-style zipper partition and 1 exterior zippered pocket. 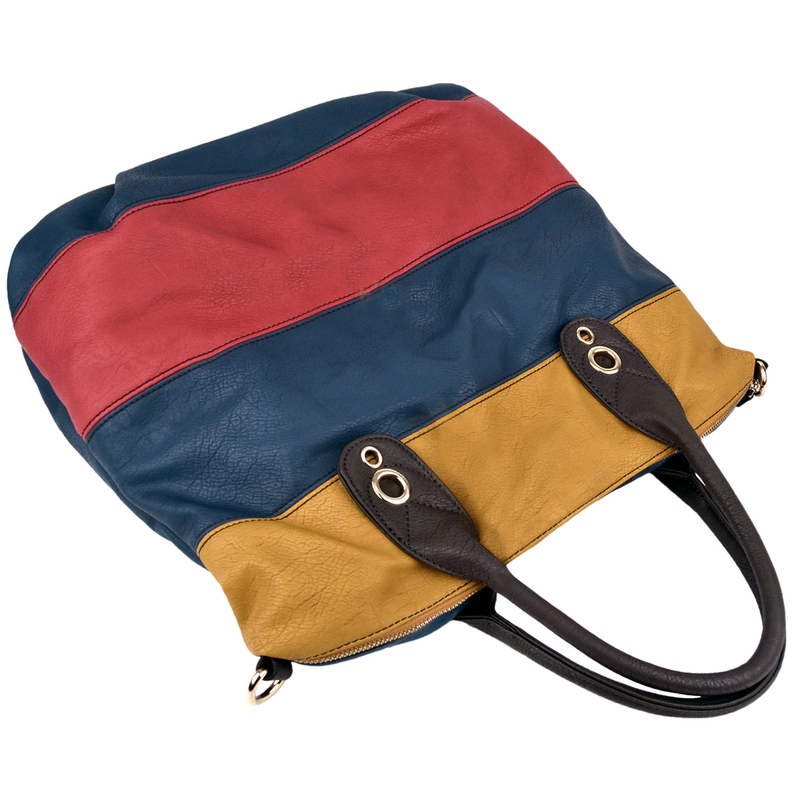 Carried by the 2 top handles or adjustable chain-and-leatherette shoulder strap. The rich, gorgeous earth tones on the soft man-made material of this satchel are set into wide, bold triple stripes to punch up the style factor without losing the tote bag's understated elegance. Peek inside to find that this hobo bag is perfect for keeping you prepared as well as fashionable. The roomy main zipper compartment of this top double handles handbag provide tons of space to stash everything you need to make it through the day and combined with 2 top open pockets, 1 zippered pouch, 1 pouch-style zippered partition pocket and 1 exterior zipper pocket. Just grab hold of this shoulder bag by the 2 top handles or slip the removable chain-and-leatherette shoulder strap over an arm to keep all daily essentials close at hand throughout the day. This buckle style handbag pairs flawlessly with the season's latest trends, and it gives even your everyday jeans-and-top combo that splash of stylish flair. For a chic bowler that doesn't skimp on the storage space, this shopping tote bag is the perfect choice.